Let me start by saying this photo just makes me laugh. Yes, I know that it is technically horrible but I am posting it anyway. 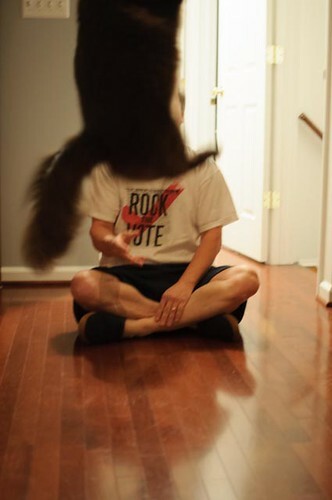 I was out all day and realized I hadn't taken my photo yet so I thought it would be fun trying to photograph our cat Leo jumping. My husband threw the cat toy up in the air. Well as you can see I had no idea how high he could jump, do you see the light switches on the wall? He is crazy high for a short legged cat. So here is my daily post for #NaPhoPoMo blurry cat and all.